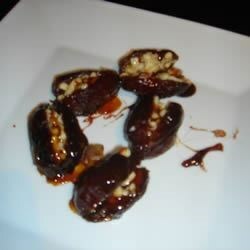 "This dish of dates stuffed with chopped nuts is a 'home style treat' that was once savored in ancient Rome. You can replace the pine nuts with almonds if you prefer." Stuff dates with chopped nuts: the nuts are inserted into the space left by the pit. Place dates in a small pan. Sprinkle with pepper if desired. Add wine, then drizzle honey over dates. Cook over medium heat until the skins begin to peel off the fruit. Transfer dates to a serving dish, and allow to cool slightly before serving. Make a simple bruschetta with ricotta and sautéed mushrooms. I give 5 * for flavour, but I'd deduct one * for the time-consuming preparations. We enjoyed these with the peppery honey glaze... it does lend a touch. Great, unusual snack! so easy and so delicious. also did with maple syrup once instead of honey! My friends and family LOVE these. I now have to keep dates on my shopping list as it is so often requested! delicious, but I crowded the pan with too many and they were messy! A little unusual at first, but very addictive. In the future, I'll just stir in the pine nuts. Stuffing the dates is what takes up all of your time.